So you say you’re tired of endless runners—how about an endless shambler? 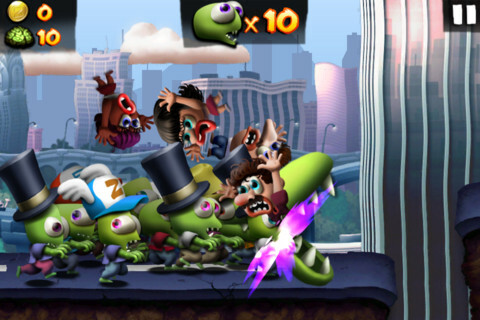 Mobigame’s Zombie Carnaval (Free) plays like the undead lovechild of Jetpack Joyride (Free) and Grim Joggers [appprice url="http://appshopper.com/games/grim-joggers"]. This is not a bad thing. Bringing zombies into the equation was a brilliant move, making the game less about going the distance and more about gulping down gray matter. Your horde isn’t important, and neither is the distance you travel. All that matters is the next tasty brain. So despite the crushing sense of familiarity, Zombie Carnaval is a game you really need to own. Running with a pack, devouring humans to add them to your crew—this is good stuff. Good enough to make the game almost impossible to put down. You’ll never be more than a run from completing some kind of goal, so why would you ever stop playing? Is that a selling point? I mean, you can’t throw a stone in the App Store without hitting a game that’s “addictive" or “can’t be put down" but Zombie Carnaval pulls out every trick in the book to keep you going. Each brain you collect gets stamped on a card—max the card out and you get a lottery ticket with a host of potentially great prizes. Each coin adds to a total that can be used to buy all sorts of great things for your zombie horde. The curve for high scores is relatively low, so each run is a new shot at the leaderboards. And there are always missions on tap to work toward. It’s obscenely effective at leaving players without an obvious stopping point. If it weren’t such a well-crafted game, I might be bothered by that. As it stands, Zombie Carnaval is clever enough that I want to forgive every one of its tricks. Check it out: you start out with a single zombie, and each human you devour gets zombified and adds to your horde. One zombie alone isn’t strong enough to pull people out of their vehicles, but a pack of four can crack open a car and eight can break down a bus. So you grow your horde to devour humanity, and then zombies start to die. A zombie horde isn’t a tightly-packed crew—we use the verb “shamble" for a reason. So as you run, your horde spreads out across the screen. 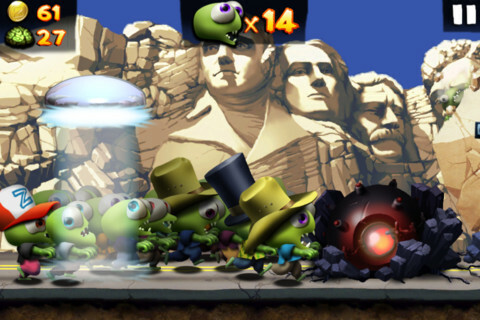 Tap the screen and the leader jumps, and every zombie has to jump in turn. Hold your finger down and they all stay up a little longer. This is pretty manageable when you’re just jumping over gaps, but try dodging a moving car with twelve zombies jumping in a row. It gets messy. Strategically speaking, losing a few zombies costs you nothing. As long as one zombie lives, the horde lives on through it. A lone zombie actually has things pretty easy, but it’s also much more vulnerable to a stray bomb or a sloppy jump. So most good runs will go in waves of building up to a mighty horde, then getting whittled down to just a few shamblers. Don’t feel bad—it’s worth letting some of your horde tank a bomb or a helicopter if it means another tasty brain for the rest. Things get really interesting when you run into a power-up. These transform the whole horde into something ridiculous, like, say, a pack of undead quarterbacks that barrel through obstacles, or a giant zombie-monster armed with laser beams. You can spend your coins working your way through an upgrade tree that makes these monstrosities unstoppable, or you can fritter it all away on one-time power-ups, lottery cards and silly hats. Your call. And, yes, you can buy IAP coin packs if you need a boost. They come quickly enough in-game that I’ve neither wanted to nor felt I was missing out without them, so take that as you will. Zombie Carnaval is so tight it leaves little room for complaint, but you might notice a few oddities. The camera is pulled in close—too close to see much more than your horde. You can’t see the other side of a jump when you start it, and the game needs to pop up alerts well in advance of an obstacle. You’ll probably get used to this—I did—but it never stops feeling claustrophobic. On the flip side, if you’re judging based on screenshots the visual style of the game might come off as really awkward. In motion it’s great. Working with peppy music and unsettling moans and groans, it makes for an atmosphere that’s downright unsettling. 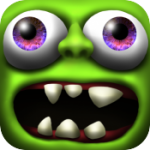 It’s hard to say an endless runner is truly special when it’s quite this derivative. Barring the look, there’s little here we haven’t seen before. But here’s why you need Zombie Carnaval: every little bit of it comes together so well that it’s going to be hard to beat. Forget the IAP, forget the familiarity. If this came along a year ago we’d have been blown off our feet. Now? It’s one of a horde, but it’s leaving the competition in its dust.